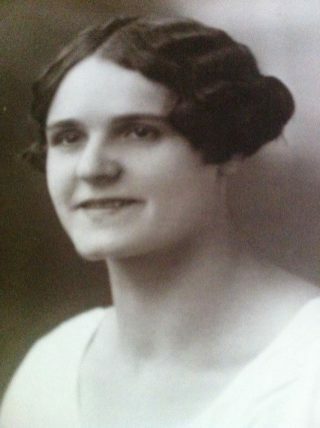 Trade unionists played a key role in the Second World War. 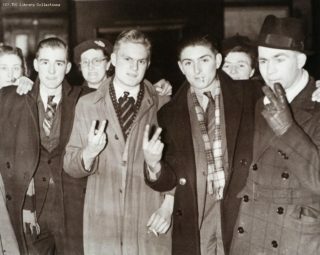 Indeed, one of the big differences between Britain and Germany was that while the Nazis relied on forced labour, here workers retained all their peacetime rights, including the right to strike. As well as seeing that workers were fairly treated, unions played a prominent role in tackling labour shortages, building relationships with allies and boosting morale at home and overseas. The images below give us a glimpse of the role of the trade union movement during World War Two. In 1940, trade union leader Ernest Bevin became Minister of Labour and National Service as Labour joined the wartime coalition government. 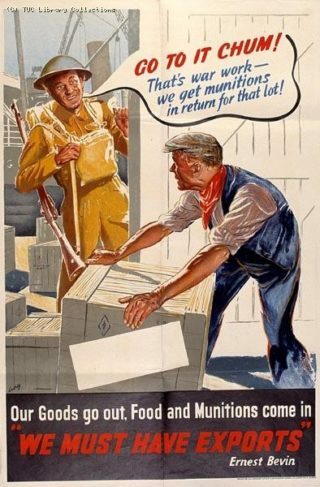 Ernest’s rallying cry of “We must have exports” appeared on several posters, inspiring people to go to work to support the war effort. By 1944, a third of civilians were employed in war work, including over 7 million women. Union membership increased by three million in six years. When Nazi Germany invaded Russia in June 1941, the TUC set up an Anglo-Soviet Trade Union Committee. TUC General Secretary Walter Citrine personally went on one of convoy ships that provided support to the Russians through the treacherous Arctic Ocean. A delegation from Russia visited Britain in early 1942, touring factories and other workplaces around the country. In London, the delegation met Winston Churchill and made a BBC radio broadcast. In the centre of this photo is the only woman on the 13-strong delegation – Madame Malkova from the Soviet Government Workers’ Union. During the war, the TUC and trade unions funded over 50 mobile canteens and cinema vans. These fed and entertained the military overseas and in isolated searchlight stations and anti-aircraft units in the UK. The canteens also fed people in towns and cities destroyed by bomb raids. The vehicle in this photo was donated by the Amalgamated Engineering Union. By 1943, labour shortages had led to a coal crisis. In October that year, Ernest Bevin introduced the ‘Bevin Boys’ scheme. This involved young military recruits selected by lottery who were given jobs in the pits instead of being sent to the battlefields. The scheme ran until 1948, with around 48,000 Bevin boys recruited. Here, Bevin Boys are leaving St Pancras station in London, bound for training in Derbyshire in January 1944. 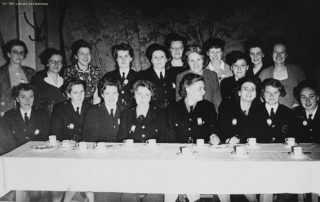 These women are at the Fire Brigade Union’s annual conference ‘austerity’ dinner in 1943. At that time there were around 86,600 women in the National Fire Service providing crucial back-up – staffing communication centres, running canteen vans and acting as drivers and messengers. 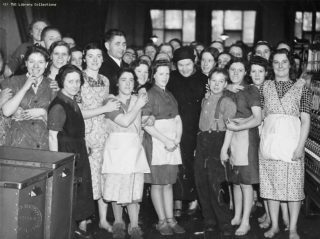 In 1943 the FBU Women’s Conference agreed to campaign for a Firewomen’s Charter for equal pay, improved training, conditions and facilities.